I wanted to do something different with some Mahi fillets. I sauteed them with adobo sauce and then topped them with chopped pineapple and tomatos. 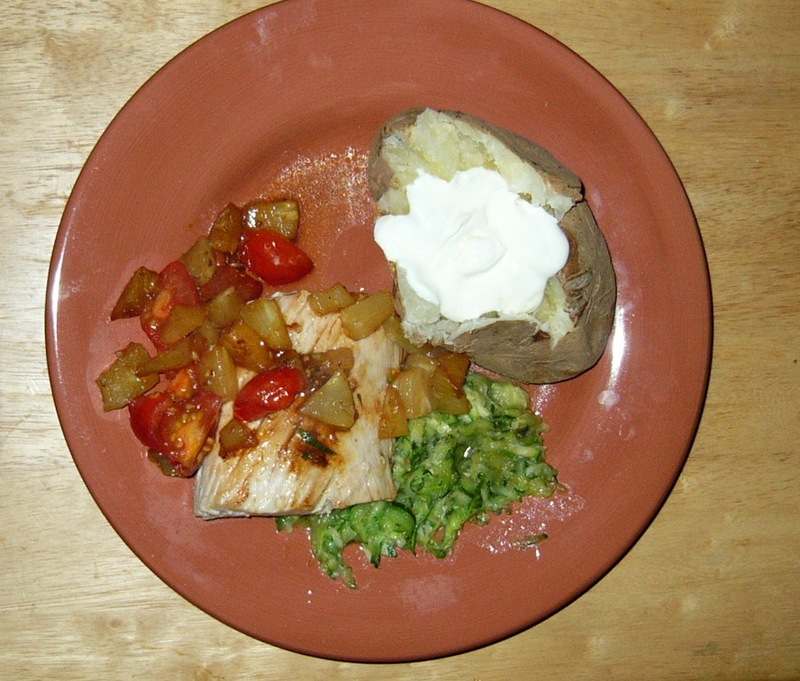 I served the mahi mahi on a bed of shredded zucchini which I cooked in olive oil and parmesan cheese – tasty – served alongside a baked potato – it made for a tasty meal! 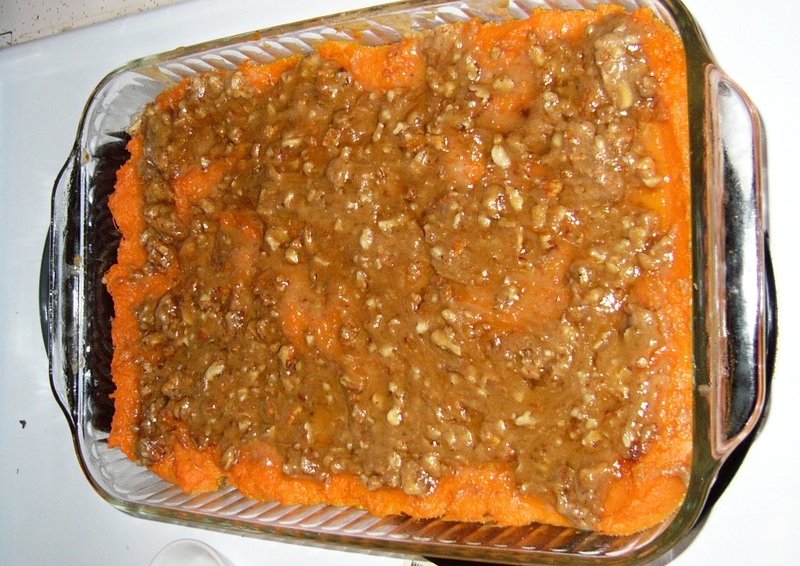 These are delicious and when you read the ingredients you’ll see why….they are not healthy for sure, but surely you must get some of the benefits of the sweet potato from this dish despite the fact that it tastes like a dessert. I prepared mine today and will bake them in the morning – I’ll attach a picture of the bubbly goodness then. Happy Thanksgiving – enjoy the food! Here is a shot of my dinner tonight. 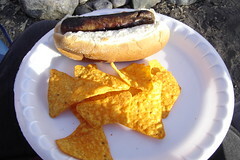 We went to a boy scout cook-out, where the kids were learning how to start a fire and cook on it. I think they did a fine job! I didn’t take a pic of the smores, but they were good, too. 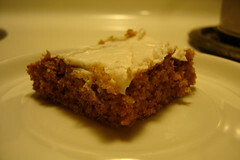 Here is a pic of the pumpkin bars I made last weekend. So moist and delicious, they were! I broke in the kitchen aid mixer today by making a focaccia I have been wanting to try. Here’s the recipe – its quite tasty and makes the house smell great. 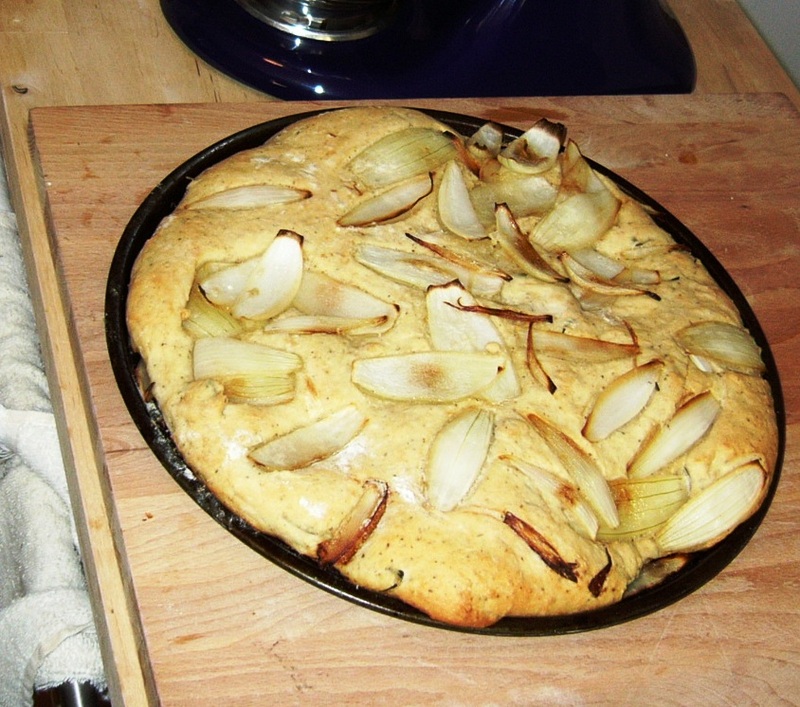 Place all ingredients except onion in the mixer; mix until dough ball forms; add onion (without the liquid) and remix – the dough will be wet and the onion will be sort of clumpy; Turn dough onto well floured board and kneed briefly to form a ball. Oil a pizza pan; place the dough on the pan and pat into a 12-inch disk. Coat the top of the dough with the onion juices. Cover with plastic wrap and let it rise until doubled in bulk. Preheat oven to 450 degrees. Just before baking use fingertips and gently make indentations in the surface. Drizzle with Olive Oil and sprinkle with salt and pepper. Bake for 10 minutes – reduce heat to 350 degrees and bake for another 12-15 minutes until gold brown. 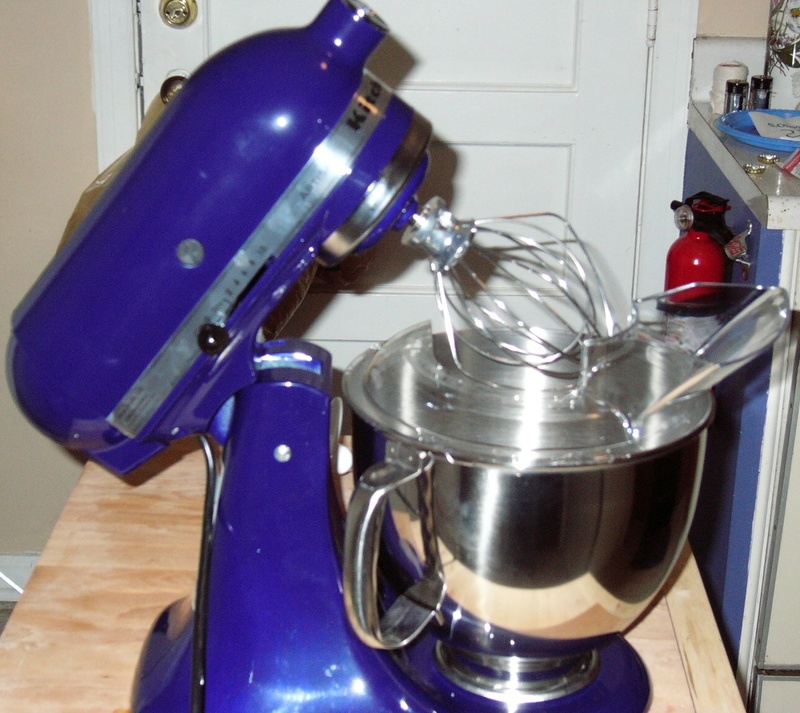 I am getting a kitchen aid mixer! 🙂 – My sister and I are splitting the cost and calling it Christmas – I will post a picture of it later – I am sure this will inspire new recipes! with these crab entries????? I AM LAND LOCKED AND CAN NOT EVEN SEEM TO FIND DECENT FROZEN SEAFOOD. Bleh. On a slightly less negative note, I did attempt both the apple/cheddar soup and the pumpkin bars. The soup was not good. I’m not sure what I was expecting, but this wasn’t it. I guess I’m not a sweet soup person. I didn’t even use all the apple the recipe called for, and still it was way to sweet. The pumpkin bars, on the other hand, were a very pleasant surprise. Here’s the recipe…. Preheat oven to 350 degrees. Cream the butter. Add the brown sugar, eggs, pumpkin and vanilla and mix well. In a separate bowl, sift all of the dry ingredients together. Gradually add to the wet mixture and mix well. Pour into a greased 9×13 baking dish and bake at 350 degrees for 15 to 20 minutes. When cool, use the icing of your choice. I took the lazy way out and used the end of a can of vanilla frosting I bought to glue in the tongues of my nutter butter snakes for Halloween. I think cream cheese frosting would be better. I’ll post a pic later of this.